First off, sorry for being not so active during the past week. I'm having a really busy time at university at the moment. I hope to have more time near the end of the week. So, on to today's teaser! 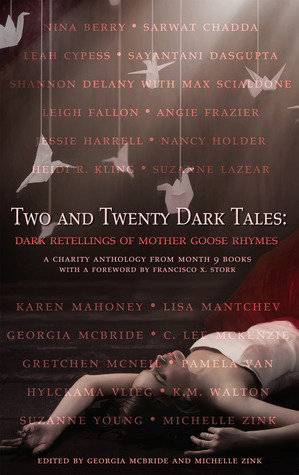 It's from Two and Twenty Dark Tales, an anthology coming out today that I got from NetGalley. It features retellings of Mother Goose Rhymes from various authors. I'm only about halfway through but I'm enjoying most of the stories. I know, more than two sentences. But they're short ;) Can you guess (from the story title) what Mother Goose Rhyme this is from? And what are you teasing us with this Tuesday? And those teasers were good. :) Sounds interesting. ooh I know what this is but will just use the first letters so as not to spoil it for everyone else. HDD. Awesome teaser! The real tales were so dark!